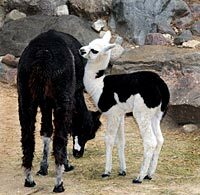 In the morning hours of August 10, 2012, the Milwaukee County Zoo welcomed a baby, male alpaca, born to mom, Ellie, and dad, Sooner. Weighing 16 pounds, 5 ounces, with fluffy, handsome, white and black fur, he’s definitely turning some heads! But it’s not just visitors’ heads that are turning, since Gustavo apparently enjoys running around in circles, in the exhibit, when he’s excited! He’s exhibiting a very feisty, outgoing, curious and good-natured personality. Gustavo is still nursing from mom, Ellie, but he is expected to start sampling hay, grass and pellets soon. By the time he reaches adulthood, he will have grown to somewhere between 120 - 140 pounds. Help us welcome Gustavo to our animal collection – Visit him in the South America Outdoor Exhibit, daily. Alpaca are members of the camel family. 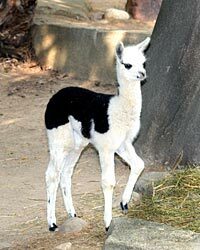 Alpacas are native to the Andes Mountains of Bolivia, Chile and Peru. In the wild, alpacas eat grasses and weeds. They live in altitudes of 12,000 feet. Their thick fur keeps them warm.